Ward 4 Councilman Dave Ware previously called a downtown meeting to discuss the parking issues that have arisen and will continue increase with such robust downtown redevelopment growth. Approximately twenty downtown business and property owners, along with the Hattiesburg Patriot were present. Several parking space solutions were discussed, including the possibility of returning Pine and Front streets to two way traffic, reducing some streets to one lane and using the right hand lane for diagonal parking , and/or the construction of a new parking garage. It is estimated that downtown needs an additional 300+ parking spaces, with current growth, including Hub City Loft's expansion of approximately 62,000 square feet of new development, which includes 55 new apartments, retail, and commercial spaces. Concerns with all options were brought forward by members of the group. Ware said that further traffic studies would need to be done to identify the optimal solution, but the change from one way to two way streets could possibly result in a reduction of through traffic to Petal along Front and Pine streets. The construction of a roundabout where Hardy, Pine, and Front streets intersect was also discussed. A roundabout might create better traffic flow and traffic efficiency. This option would also open up space for additional parking, although this parking would not be in the immediate proximity most desirable for downtown's current needs. The most popular solution was the construction of a parking garage, near the railroad and adjacent to existing buildings, but estimates by Neal Shaffer topped a whopping 8 million dollars for 300 spaces, a cost that many in attendance said was much too high. The foundation for such a garage would be expensive given the proposed location's proximity to the railroad and existing buildings. A viable cost for such construction would need to fall within the 2 to 4 million dollar range to be profitable. The win, win scenario mentioned by Ware would be to use private funds to build a two to four million dollar garage, lease spaces back to the city, and give the city buyout options at five, ten, and fifteen years once a profit can be established. If a profit point can be established the city can issue revenue bonds to purchase the garage. The problem now is the city's $80,000 to $90,000 deficit with the spaces it currently maintains and leases. The original press release from Hub City Lofts, LLC can be see below. HATTIESBURG— The revitalization of Downtown Hattiesburg is in full swing, and Hub City Lofts helps it take another leap forward with the mixed-use rejuvenation of two of the area’s most prominent buildings. With the help of Hattiesburg’s Albert & Associates Architects and construction by Thrash Development, LLC, the buildings will sport a combined total of approximately 62,000 square feet for 55 new apartment spaces, retail and commercial spaces, professional spaces, and even courtyard space to relax and enjoy the Downtown scene. The result is the urbanite lifestyle combined with the energy of healthy living and a vibrant work community to create a dynamic environment, an escape from suburban sameness, and a portal into the heart of Hattiesburg. Both buildings have been renamed with names from their past. The America Building (formerly the Ross Building), located on the corner of Front Street and Short Street, represents a time of intense artistry, creativity, and free-spiritedness. Its reclaim on life fosters a Laissez-Faire atmosphere, creating a work-live-play place that seeks those who have come to embrace that fact that we can change the world. The Carter Building (formerly the Faulkner Building), located on the corner of Front Street and Main Street, returns to its original namesake. John Carter was a distinguished gentleman whose name was synonymous with stalwart character and a rich love for Hattiesburg. The Carter Building’s handsome stature and strapping details portray confidence and purpose, making it the pinnacle landmark in Downtown. Hub City Lofts, LLC, is located in Hattiesburg, MS. Project participants include: Albert & Associates Architects, Thrash Development, LLC, and financing by Trustmark National Bank. 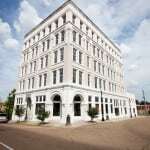 For more information, call 601-336-2385, or visit www.hubcitylofts.com. Ok got ya. That makes sense. it is a strange balancing act between pedestrian friendly and parking. too much parking and you have a place that no one cares to be in. too little, and not many people can use it. If I recall, without seeing the plans, front.could be made one lane, with.one lane as used as diaginal parking and Pine converted to bidirectional downtown lanes to makeup the loss of a lane on front.Read more.. I don’t see how changing front and Pine to two way traffic would substantially increase the available parking??? I do understand how that might decrease the thru-traffic, as described in the article.Read more..